Starting in RacePoint Blueprint version 4.3.2, Internet radio stations that are accessed by the Squeezebox will have the option to be selected directly from a single button or popover. 1. 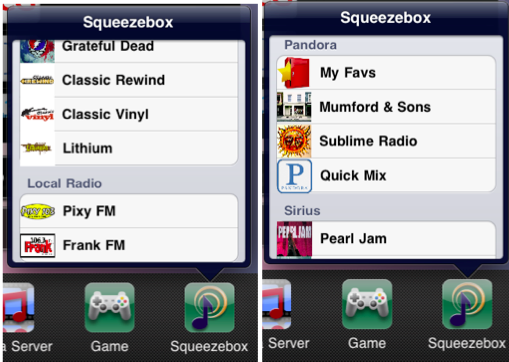 Add any desired items, including iTunes songs or Internet Radio Stations to your Squeezebox Favorites list. 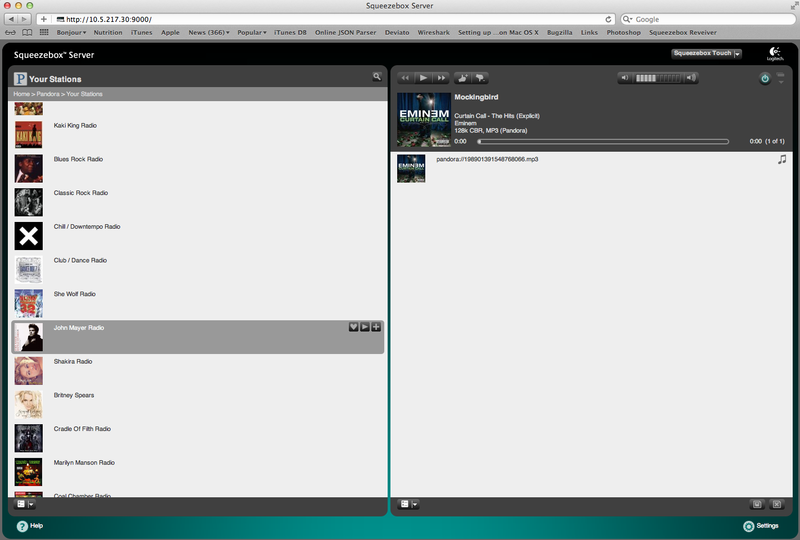 Note: You can add the desired items from a web browser. Select the Heart button to add the station or song to your Favorites list. When the station or song has been added to the Favorites list, the icon will have a -. 2. Select the Favorite using the web interface and copy the URL. NOTE: Once the URL has been setup and RacePoint Blueprint™ and the configuration has been uploaded to the system host, you do NOT have to keep the Favorite on the Squeezebox. The station or song will still play if it has been removed from the Favorites list from the popover or button. In order to set up a button that will activate the Squeezebox service directly to a specific Internet radio station, you only need to create a workflow and attach it to a buttons Press or Release command. 3. Set Action to CommandSendRequest. 5. Add a button to the desired screen where you want to select this service from. 6. Drag the workflow you just created from your Services window into the Release Command value. 7. Go to Tools > Edit Popovers and create individual items for every Internet Radio Station or iTunes Song from your Squeezebox Favorites list that you want to add. 8. 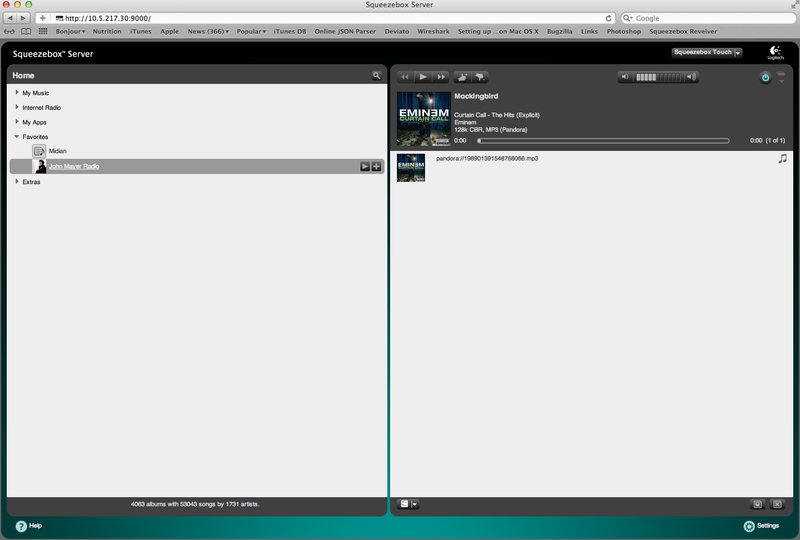 Drag the Squeezebox PowerOn workflow from the Services screen to Release Command. 9. Click the Service Bindings drop-down menu and secondary click > Clear Value of every field within. 10. Set Command Type to ServiceRequest, Item Type to Normal Item. 11. Paste the song or Internet Radio Stations URL into the URL field that you copied from the Favorites list on the Squeezeboxs Web UI. 13. 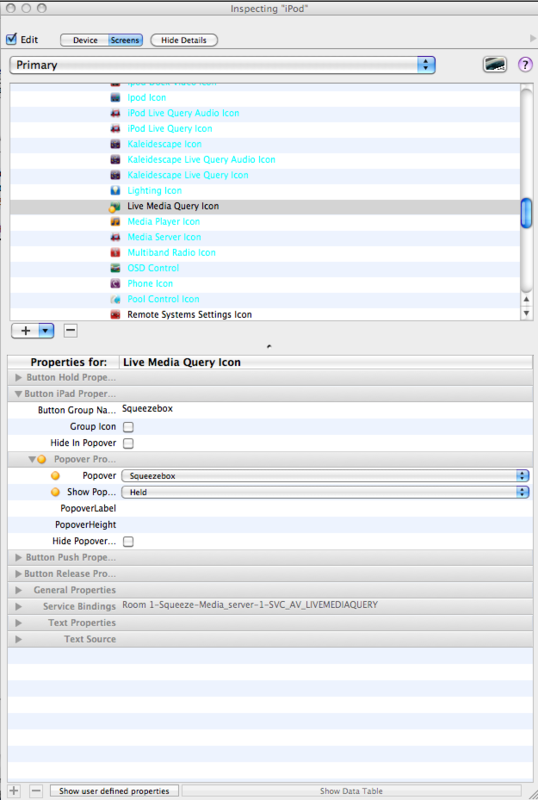 Select the Live Media Query Icon. 14. Within Button iPad Properties>Popover Properties, Select the popover you made for the Squeezebox and set Show Popover toHeld. The popover will only appear if you hold down the Squeezebox service icon.